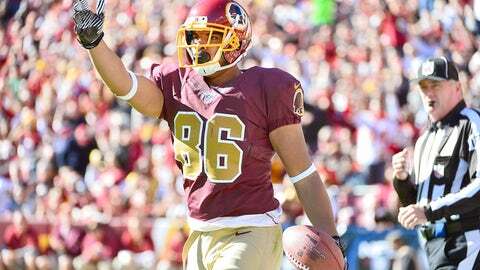 Redskins tight end Jordan Reed has 45 receptions for 499 yards and three touchdowns. One day after Redskins quarterback Robert Griffin III was benched for the remainder of the season, another cog in the team’s offense will be shut down. Rookie tight end Jordan Reed will be held out of play for the remaining three weeks of the year, multiple sources close to Reed told FOXSports.com. Head coach Mike Shanahan said Thursday that there hasn’t been any discussions to end Reed’s season, but sources indicate the team doesn’t want to risk its prized tight end as it winds down a dismal season, which has seen it go 3-10 thus far. Reed sustained a concussion in Week 11 and hasn’t played since. While he’s practiced and been cleared, he has been scratched prior to kickoff since being injured. Reed has not participated in any practices this week. The third-round pick from Florida leads all rookie tight ends in receptions (45) and yards (499) even after missing four games. Griffin was informed by Shanahan on Wednesday that the team would opt for Kirk Cousins to protect its investment in a franchise quarterback.